Play White Wizard Slot Online with 500 Free Spins! White Wizard is a 25 payline online slot by Eyecon. It has a 94.9% RTP and Free Spins bonus round when 3 or more Dragon symbols appear on the reels. Do you know that wizards have powers to treat with amazing slot games? In this money slot game, you do not need magic wands to unlock the fun. All you need to do is play with real money. Rose Slots brings you this interesting online slot game featuring magic wands, unicorn, tomes, and so forth. Continue reading to discover more about the slot game. 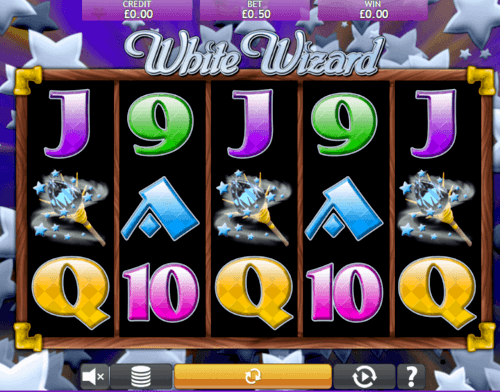 White Wizard is a magical themed online slot game. All the symbols in this game are magical related. The visuals are enticing and offer an immersive experience during play. The sound is also nice to hear during play. You can get in at Rose Slots to feel the power of the White Wizard and play real money slots. White Wizard is enjoyable on mobile devices and desktops. White Wizard is a 5-reel and 25-payline slot game. A beautiful unicorn, ancient looking tomes, cauldrons, magic wands and playing card values all represent the symbols of this game. The wild symbol of this game is the White Wizard himself who substitutes other symbols on reel 1, 3 and 5 except for the scatter to form a payout-winning combo. At any reel that the White Wizard completes a combination, the winning is tripled. The dragon symbol is the scatter. The objective of this game is to land 5 of the magical symbols on the active payline to earn a jackpot. The number of credits that can be wagered in this game can be altered and adjusted using the +/- arrows on the CHANGE BET AND CHANGE LINES area. After you have selected your bet hit the SPIN button to get the reels spinning. You can spin the reels automatically without interruption with the Autoplay option on the screen. If you have been looking for real money slots that features an interesting gameplay and overall amazing experience, then you really need to try out the White Wizard slot game. You are definitely going to enjoy every moment of the game. Just like many other UK slots, the White Wizard slot game has helpful bonus features to make the game more interesting. The free spin feature is activated by landing three or more scatter symbols on the reels. This can earn you up to 25 free spins. 3 dragon symbols offer 15 free spins, 4 dragon symbols offer 20 free spins and 5 dragon symbols offer 25 free spins. The wizard himself is an expanding wild. If he appears on the reels he turns other symbols into wild thereby increasing your jackpot. White Wizard is powered by Aristocrat. This licensed and regulated online slots developer has powered many engaging slot games. Other slot games that are related to White Wizard are Irish Luck, Rio Bingo, Noughts & Crosses, Las Cucas Locas, The Mummy, Spinata Grande, Lady of Fortune, Enchanted Crystals, Enchanted Prince slot game, Moon Goddess and Diamond Queen. An interesting experience awaits you as you take time to play online slots. Eyecon presents this fantasy-themed online slot, set in the world of magic and wizardry. Play takes place in a 5x3 layout of reels and rows, with 25 fixed paylines, RTP at 95.94% and a maximum jackpot that could potentially be 3000 times your stake. Gamble and Free Spins features add variety to the base game. Bewitching, enchanting and spellbinding. Those are all adjectives that we associate with the world of magic, wizards, witches and warlocks, but they could also be used to describe White Wizard, Eyecon’s magic-themed online slot. The developer has a long history of making slot games that are driven by characters and themes; it’s a template that’s worked very well for them, and they use it again to excellent effect here. The past twenty years has really seen an upturn in the public’s level of enthusiasm for stories about magic and wizards; JK Rowling has a lot to answer for there; and whatever’s popular with the public tends to be reflected in the games slot developers create. If you're a newcomer (or should that be a muggle?) to the language of magic, we should explain the title to you. There are two types of magic; white magic, which is good, and fair, and just; and black magic, which is the exact opposite. That's an indicator that the main character in this game, our white wizard, is the friendly sort. That's good news because we'll be asking him for favours during one of the game's bonus features, but we'll get to that in a moment. As well as their cute characters and attention to detail, Eyecon is also known for making games that are colourful and vibrant to look at, and they're true to form in that respect with White Wizard, too. They consistently manage to deliver simplicity in a way that looks attractive; the backdrop of White Wizard is basic, consisting only of stars, but as we associate stars with magic it works perfectly. Add to that the fact that the reels look like a book of spells frames them, and they've got the theming just right without having to go overboard. The spirit of simplicity extends to the reels, where the lower value symbols are represented by playing cards 9, 10, J, Q, K and A. The more valuable images you'll be hoping to see on your reels are those of the wizard's wand, his spellbook, his bubbling cauldron, and his pet unicorn. Yes, wizards can have pet unicorns, and so would you if you had magic powers! You’re probably wondering when and where the wizard is going to appear, and the answer is that he’s the wild in the game. As per the written description underneath the picture of him, he’ll substitute for all other symbols in the game except the scatter. If he’s able to create a winning line by doing so, he’ll use his magic powers to triple the value of the win. We told you he was a good wizard! The scatter in White Wizard looks like it’s escaped from one of Eyecon’s other major games; specifically Fluffy Favourites. It’s an adorable blue dragon, and if you can coax three or more of the cute fire-breathing beasts onto the reels on the same spin, they’ll trigger a bonus feature for you. The main focus of this online slot game is fun, with simplicity as a watchword, and nothing too complex getting in the way of the base game. Rather than spoil that by layering multiple bonus features on top of the base game, Eyecon has included only two bonuses; one of which they're known for using in almost all of their games. The main bonus feature is a generous Free Spins feature. To trigger it, you'll want a minimum of three dragons to land on your reels. That will grant you 15 free spins. You get an extra five free spins if there's a fourth dragon, and five on top of that if you manage to find five on the reels at the same time. When the free spins are in progress, you'll be seeing a lot more of the wizard; every time a wild symbol appears anywhere on the reels, he'll turn the entire reel wild and hopefully create a number of additional wins for you. You wouldn't get that from someone who practised black magic! The other feature on offer is Eyecon’s standard Gamble Feature. It’s a double-or-nothing round, where can opt to wager the value of your last win, and you’re presented with a 50/50 choice. Guess correctly and the prize doubles, guess incorrectly and you lose whatever you just won. If luck is on your side - and stays there - you can use the gamble feature a maximum of five times in a row to really push your winnings up. Eyecon is a well-established online slot developer who has a long record of making great games. They're not the most prolific of all the companies making online slots, but when they do release a game, it tends to be a popular and well-received one. Any time you play an Eyecon game, you instantly get a feel for the level of attention to detail that went into making it. That probably comes from the development company's past; they started out in business making video games, before realising they'd make a lot more money with slots! They didn't waste too much time doing down the wrong path, though. Eyecon was founded in 1997, and by 1999 they were already gearing up to make a move into slot development. Between those times, they had an internet hit with a game called ‘Gore'; a first-person survival-themed horror game that owes more than a little to the classic ‘Doom'. With millions of downloads, the game went viral before ‘going viral' was a phrase. It would be four more years before Eyecon produced their first online slot, although to be fair to them, online slots didn't even exist when they started planning for them at the turn of the century. It was Temple Of Isis that was their first game; a slot that would be considered quite simple today, but was years ahead of all of its competition in 2003. It's even still available to play today; we offer it on roseslots.com under its new name of ‘Temple of Iris'. Where Eyecon have found real success is in the development of games that people want to play repeatedly. Whereas some developers release a game knowing that it will probably be dead in twelve months, Eyecon is always confident that they can get years of play out of their best releases; confidence that's backed up with experience in the shape of Fluffy Favourites. Three years after the success of Temple of Isis, Eyecon struck gold with Fluffy Favourites. The cute game, where cuddly toys come to life and try to help you win money, struck a chord with the gaming public that few expected it to. Players fell in love with it on sight, and more than ten years after it was first released, it remains one of the most-played slot games anywhere. It's been the inspiration for a whole series of associated games and sequels, with more games planned for the future. The demand for Fluffy Favourites games feels insatiable, but Eyecon does their best to feed it anyway. Historically, Eyecon has gone with quality over quantity, with comparatively few games released considering their many years of operation. The past couple of years have shown an increase in output though, and with plenty more future releases plans, the company may be changing tactics to keep pace with the future. There's nothing wrong with their current business model though; on average, a bet is made on an Eyecon game 11,500 times every minute. Whilst it’s odd for Eyecon to mention that the quality of animation within the game isn’t the best, we think the point they’re trying to make is that this is a gentle game with a traditional feel, which can be generous with payouts, but doesn’t intend to compete with a super-slick modern video slot. The functionality of the game is more important than how it looks, and White Wizard functions very well. Fantasy is a popular theme with online slot developers, and wizards, in particular, make regular appearances on the reels of many a slot game. That being said, Eyecon are a company who tend to go for quality over quantity; they have comparatively few games available for a company who've existed for so many years, preferring to limit themselves to only releasing new games when they're 100% positive they have a hit on their hands. Except for their legendary Fluffy Favourites series, that means they tend not to cover the same ground twice. In the case of White Wizard, though, they've made an exception. This game has both a jackpot variant and a sequel. White Wizard Jackpot: The pattern for developers when releasing a ‘jackpot' version of one of their games is usually to keep almost everything the same, and link the game to a progressive jackpot. That's what a ‘jackpot' version of any game really is; a chance to play a game you already know and love, but with the chance of winning a much higher prize than you'd get in the original game. Eyecon hasn't gone down that route with White Wizard Jackpot, or at least not completely. As well as the progressive jackpot being connected, Eyecon has added ‘Reel Power' mode; a feature that enables you to bet on the individual reels rather than just the paylines. There are further multipliers within the game, and extra scatters that appear when ‘Reel Power' is enabled. This complicates the original game a little bit, but on a basic level, it's still the same. As with every ‘jackpot' game, the RTP drops down to allow for the higher maximum prize; in this case, it falls to 89.9%. White Wizard Deluxe: The sequel to the original White Wizard doesn't change much about the game's visual appearance or the layout of the reels, it does throw in a little more for players to aim for. The most significant change is to this online slot is the number of paylines, which shoots up to 100. If you enjoy the first White Wizard, then you're highly likely to enjoy the second one just as much; if not more. It's basically the same game, but with more different ways to actually win at the game. The RTP for this Deluxe version is 95.5%. Eyecon doesn't have any additional magic-themed games; they've just added to and adjusted White Wizard a couple of times to keep it fresh and exciting. Plenty of other developers have taken their own crack at the genre though, and here are some of the more notable efforts. We have some of these games available to players at roseslots.com; so if you like the sound of any of them why not give them a try? Wild Wizards: This game from Saucify, released in 2015, has more than a couple of things in common with White Wizard. The 5x3 layout is the same, the 25 paylines are the same, there's a free spins feature which is mostly the same, and even the RTP is similar at 94.9%. Wild Wizards isn't quite a clone of White Wizard, but it's as close as it can get without becoming one. It differentiates itself by having a darker graphical theme. Lucky Wizard: Red Tiger Gaming have taken two popular slot gaming themes and merged them together to make Lucky Wizard online slot. On the one hand, there are obvious cues taken from the magical world, and on the other, it's packed full of references to Irish folklore. It's a fusion slot game! If Rainbow Riches and White Wizard got together and had a baby, it would probably look like this. It's actually a bigger game than either of them, with a 5x4 layout and 40 fixed paylines, although RTP is a tiny bit lower than White Wizard, at 95.12%. Many of the game's numerous bonus features are triggered at random, but the prize picker feature that you can activate from the base game is a fun one. Lucky Wizards is also available at roseslots.com if you'd like to try it for yourself. Winning Wizards: We have to go a little further back in time to find this wizard-themed online slot from Microgaming, which has been online since 2014. Winning Wizards has a charming comic-book style graphical design that will endear it to players, but it will definitely be too basic for some tastes. The 5x3 layout offers only five fixed paylines, and no bonuses or extra features whatsoever. There is a massive jackpot of 10,000 times the initial bet to chase after though, so that might reel some of the big prize hunters in. RTP on Winning Wizards comes in at 95.46%. Eyecon usually does better than most other slot game developers when it comes to creating mobile slots from their online games. They've developed a software wrapper that loads their games when you try to access them from a smartphone, and the wrapper is clever enough to know how to format and display the game on your device. That means intelligent placement of buttons, and reels that are well-scaled and easy to see. As we've seen them do it well so many times previously, we didn't expect to find anything to complain about with White Wizard when we loaded it on our own phone. We still don't have any complaints for the main part. One of our favourite things is that the game doesn't try to force us to hold our phone a certain way; if you start playing with your phone held upright, and then tilt it onto its side, the entire screen will re-format itself to suit. That means the buttons move to a convenient location, and the reels adjust themselves accordingly. The scaling is excellent; we didn't have to squint or stare too hard to make out the reels, and using the buttons feels intuitive. The one place where the game falls down a little bit when played on a mobile is with its graphics. While we have no issues with the sound quality, which doesn't appear to have been adjusted or compressed at all, the graphics have definitely suffered during the conversion process. They're just not as crisp or sharp as they are when playing on a laptop, and that's a shame. They're still visible, and you can distinguish one reel from the other with no problem, but if you've moved from your computer to your phone you'll definitely notice a difference. The mechanics and functionality of the game aren’t affected at all, and truthfully it doesn’t actually change your experience of playing the game, but it is a slight irritation. We only mention it all because we’re used to Eyecon’s conversions being perfect, and so we came in with high expectations! If you play and love White Wizard as an online slot, you’ll still love it as a mobile slot. It just isn’t quite as pretty. White Wizard is no longer a new game, and that isn't good news when it comes to getting the attention of the industry press. Slot games tend to be written about a lot when they first come out, and then never again unless they go on to achieve phenomenal success of the sort Rainbow Riches and Fluffy Favourites have. White Wizard was well received when it launched, but it's not a game with multiple sequels or a high profile, and so people don't usually find a reason to write about it anymore. It isn't wholly silent out there on the internet, though. Towards the end of last year, the video game website GameSpew published a thought-piece on the topic of whether or not video games could be good or us, and particularly whether it was possible for people to acquire new skills from playing them. Even though it had nothing to do with the subject of the article, White Wizard was mentioned by name and given as an example of a game that could boost your confidence. So long as it still has fans out there playing the game, we expect its name will still pop up every now and then! You may never be able to achieve that Hogwarts diploma you've always dreamed of by playing White Wizard, and it will never teach you any real magic spells, but you can still have a magical experience by playing it and activating the bonus features to pick up some nice winnings! If you'd like to head off to see the wizard, then we'd love to be your guide and have you play it with us on roseslots.com. We welcome all new registrants to Rose Slots with a package of free spins, and if it's your lucky day you could receive as many as 500! Signing up gives you access to our entire catalogue of slot games. We currently have more than 600, and we're adding new titles all the time. We have games in every category you could imagine, from the biggest and best-known slot games in the world to some of the best-kept secrets. You're welcome to explore all of our games and find out more by reading our reviews. You don’t have to spend money today just to register either. Register free of charge, and don’t put any money into your account until you’re ready to start playing. When you do decide to put money in; which is all done securely via PayPal; we’ll give you more free spins every time you top up by £20 or more. We keep on giving, you keep on spinning, and everybody has fun!